Mahmoud Abbas is planning to hold a meeting of the Palestinian National Council in late April to solidify his positions on the US and Israel and establish a more clear path to his succession. The PNC, which is the top PLO legislative committee and supposedly represents Palestinians both inside and outside the territories, has not met since 2009. The meeting will exclude Hamas and other organizations that are not likely to agree with Abbas. While the PNC hasn't met since 2009, it has an active webpage, with virulently anti-Israel and anti-US articles. 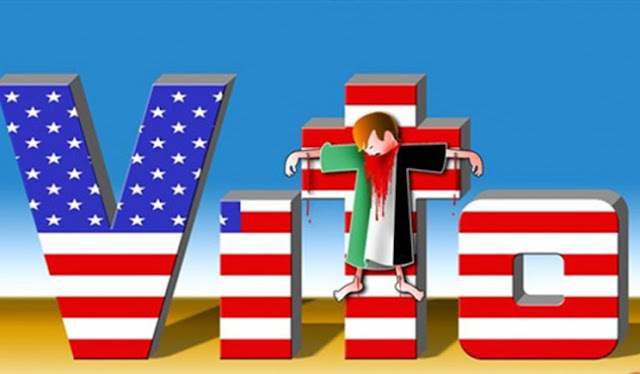 For example, the US veto of the Security Council vote against recognizing Jerusalem was marked with this cartoon that equated that with crucifying the Palestinian people, effectively substituting the US for the traditional antisemitic view of Jews as murderers of Jesus. An earlier article called on Britain to recognize Palestine as "repairing the world" for the crime of Balfour, as the PLO attempted to hijack the Hebrew phrase "tikkun olam." The main webpage of the PNC has a link to the "PLO Basic Law" from 1964, still in effect today, that says "the armed Palestinian struggle shall be supported, and every possible effort shall be made to ensure that it continues and escalates, so that the impetus of the masses towards liberation may take its course until victory is achieved." That "victory" is the destruction of Israel. And the highest legislative body of the PLO has never changed the PLO Basic Law.